He was born near Dresden, Ontario on 27 August 1874, son of William McKitrick (1844-1922) and Catherine Dewar (1851-1935). In 1879, his father and uncle travelled by train to Emerson, and then walked to an area south of what is now Crystal City. They purchased newly surveyed land two miles north of the United States border. The following year, Catherine and their three children, including six-year-old George, travelled by boat to Detroit, by train to Emerson, and then overland, on the Boundary Commission Trail, for 10-12 days by ox-drawn cart to the new settlement. After a series of difficult experiences, crossing sloughs, swimming while carrying supplies and children sick with measles, they reached the allotted land. Neighbours and help were distant. He studied at the Manitou Normal School then taught for two years at St. Lawrence School and Gowancroft School. He studied for a year at Wesley College then, upon his father's retirement in 1898, he was able to purchase the farm. By 1910, he was farming 1000 acres with 20 horses and the first tractor in the district, later increasing to 3200 acres and other real estate by 1947. Through the efforts of Canada Colonization, he and a neighbour were able to settle eleven Mennonite families on farms in the Rosebud district. 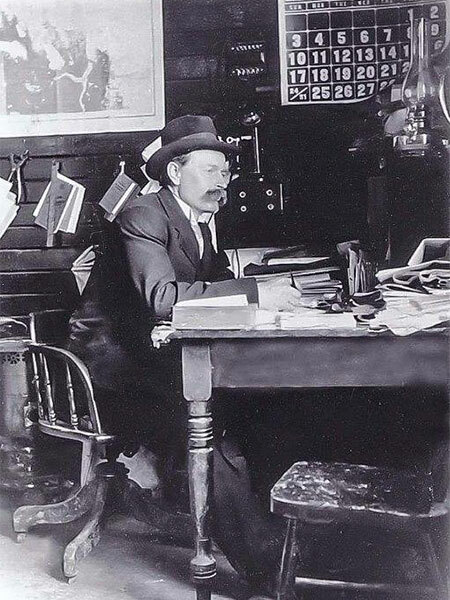 From 1911 to 1952, he was owner and publisher of the Crystal City Courier. His ownership spanned the Great Depression, two World Wars, and the evolution of Canada from a Dominion of the Empire to an independent Commonwealth member. Following the sale of the newspaper, he continued to write weekly newspaper columns, poetry and family history, and published two books: Corner Stones of Empire: The Settlement of Crystal City and District in the Rock Lake Country (1940) and Andrew Stewart of the Prairie Homesteads (1950). The newspaper office remains as the Crystal City Community Printing Museum with its original manual press still in use. A plaque in the museum recognizes his work. In 1900, he married Sarah Agnes Colter (1874-1961), eventually having a family of eight children: Edith Agnes McKitrick (1901-1994, wife of William J. Howatson), Harold William McKitrick (1903-1996), Bruce James McKitrick (1905-1949), Earl George McKitrick (1907-1981), Jennie Elizabeth “Jan” McKitrick (1909-2000, wife of Alex Tait), Myrtle Alice Catherine (1911-2002, wife of John N. Mutch), Helen Margaret McKitrick (1912-1991, wife of George A. Custance), and Mary Patricia “Pat” McKitrick (1915-2004, wife of Robert E. Buckley and Harry Wheeler). The family moved to Crystal City in 1910. He was active in community, local government and church affairs, including serving as President of the Board of Trade for the Southern District, holding membership in the Manitoba Red Cross, being instrumental in the establishment of the Crystal City Memorial Hospital in 1946, and being an executive member of the Manitoba Weekly Newspaper Association and Canadian Weekly Newspaper Association. He died at Crystal City on 6 April 1953 and was buried in the Crystal City Cemetery. “Husband slays wife, judge in courtroom,” Winnipeg Tribune, 21 June 1949, page 1. “Author is buried at Crystal City,” Winnipeg Free Press, 13 April 1953, page 16. Obituary [Helen Margaret Custance], Winnipeg Free Press, 26 October 1991, page 53. Death registration [Harold William McKitrick], British Columbia Vital Statistics. Obituary [Jennie Elizabeth Tait], Winnipeg Free Press, 22 February 2000. Obituary [Myrtle Alice Catherine Mutch], Winnipeg Free Press, 24 December 2002. Obituary [Mary Patricia Wheeler], Winnipeg Free Press, 13 August 2004. This page was prepared by June Kaan and Gordon Goldsborough.